Watch till the end for his food presentation! Take note of his Single Raise Eye Brow Performance While Cutting The Food Stuff. He is also singing along "Rojak" with music trance music playing with a mini compo. 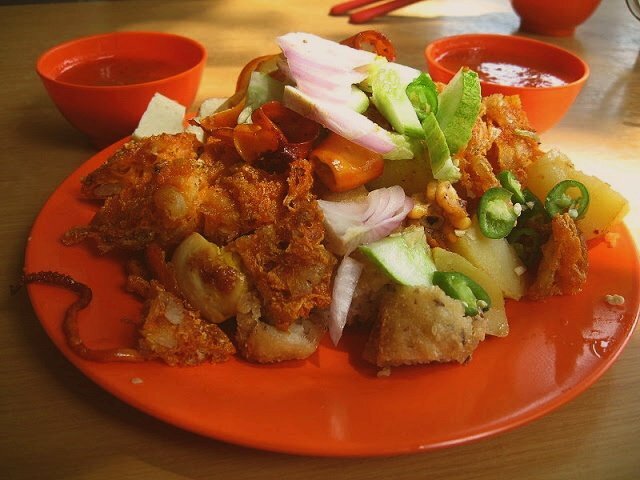 Mamak Rojak, also known as the Indian Rojak, is made by Indian Muslims locally in Malaysia and Singapore. (Mamak is derived from Mama which means Uncle in Tamil). Indian Rojak is a spicy hot salad with piping hot chillies and vegetable gravy. Usually a vegetarian food, it is also served with seafood. For making the batter, mix the ingredients except the egg, together in a bowl and add water gradually, mixing it into a smooth paste. Set aside for 40-50 minutes. Clean potatoes well and boil in their jackets. Peel and rub in ground chilli paste and salt then deep-fry in hot oil. Cut each into wedges. Cut the hard-boiled eggs into quarters with an egg-slicer. Halve the other 2 pieces of firm tofu diagonally and deep-fry in hot oil till golden brown. Just before using the batter, add the egg and stir well till smooth. Cut the remaining 3 firm tofu into thin slices and dip into the batter. Press 2 prawns onto each piece. Deep-fry in hot oil until golden and crispy. Cut each into 4 pieces. To make the fritters, combine flour, salt, sugar, baking powder and water in a bowl. Mix well and leave aside covered for 30-40 minutes. Just before frying add in the chopped onion and chillies. Shape into a cylinder about 7cm long and 2cm wide. Taper both the ends. Should the dough be sticky, dust hands with extra flour when handling the dough. Deep-fry the fritters in oil until golden brown. Cut each fritter into 4-5 serving pieces. To make the sauce, boil the sweet potatoes then blend in separate portions with half amount of water. Heat oil in a saucepan and fry ground shallots and garlic, chilli paste and chicken stock. Add in blended sweet potatoes and remaining water. Simmer for 3-4 minutes. Add tamarind juice, palm sugar and salt to taste. Stir continuously over a gentle heat for 2-3 minutes or until sauce is thick. Add peanuts and a little dark soy sauce for colour. To serve, arrange all the ingredients in a platter and top up with the garnishing and pour sauce gravy over or serve the sauce separately. Hahahah.. the rojak man is a born entertainer! This really brightened up my day. Thank you!